Shane Hope uses python-based molecular modeling research wares to tinker together thousands of theoretically feasible and nano-nonsensical molecular models into prints. 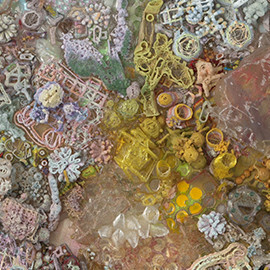 Converting bits back into atoms, he's also assembled a RepRap 3D-printer-family-farm which struggles to materialize his modded molecular models for in a new series of relief sculptures. Shane studied at the San Francisco Art Institute, San Francisco State University, Skowhegan School, and has an MFA from UCSD. Shane has shown at Susanne Vielmetter Los Angeles Projects and Carmichael Gallery in LA, participated in the 2009 Prague Biennale, is represented by Winkleman Gallery in New York and will be featured in the Fall 2013 exhibition entitled "Dissident Futures" at the Yerba Buena Center for the Arts.